Very kind of you Mark! I got on the list in 2001, and I have zero chance of being notified. Can you believe it? There are probably 500 people ahead of me, and I've been on the list for 17 years. I can't express how I feel. Indeed! I have no expectation of getting notified. If it does happen, there will be no hesitation. The long FL will be managed, and we typically have arc second and sometimes sub arcsecond seeing at my home. Plenty of other scopes for imaging. It would be fun to do a side x side compare with the 180 f/7. On November 19, 2018, Astro-Physics invited me to purchase a new 254mm F14.5 Mak-Cas. The price is $22,000. I said yes and placed my deposit. My name has been on the list since 1999. I live in Newport Beach, CA. If any of you live near me, I would love to have you visit and take a look. I expect to receive the scope in the next 120 days. Congratulations Mark. I also received notification on Nov. 19th, promptly responded and sent my deposit. I've been on the list since July 6, 1999. 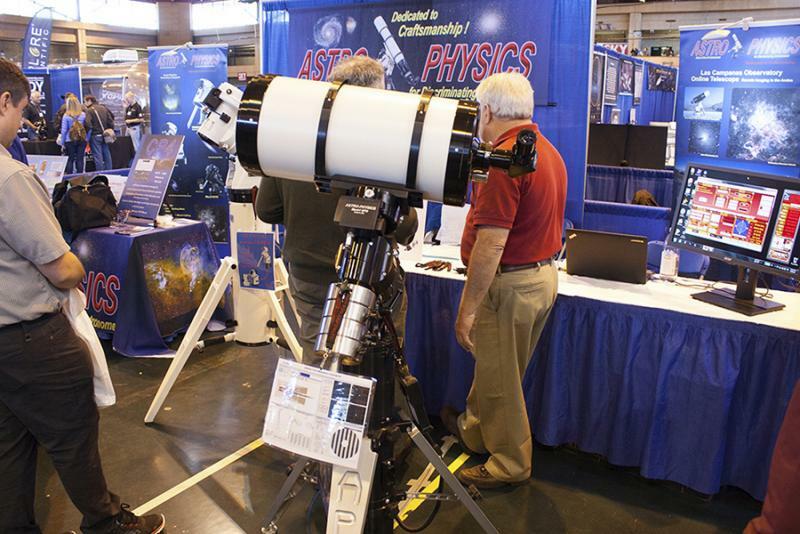 I'm in the Philadelphia area and hope to receive the scope in time for the Winter Star Party in February. I wish Roland made a 7 or 8-inch version. In that size the portability advantage of an 8” Mak (including the smaller mount needed) over a 6 or 7-inch apo really comes into play. And an 8-inch high quality AP Mak would beat a 6” Apo on the moon and planets and any deep sky objects that fit in the field. I am in agreement with you on this. In both APOs and Maks there is a sweet spot when it comes to size and aperture, with APO’s, 6” in my opinion, is the sweet spot, no doubt that a 7” APO would outperform it and an 8” would outperform the 7”, but at what cost? Same applies to Maks, an 8” Mak with smallish co. beats the 6” APO on planets while remaining very portable, lighter and smaller than 6” APO and definitely less costly, and yes a 10” Mak outperforms an 8” and a 12” Mak would outperform a 10” Mak, but again at what coast? Another advantage of an 8" Mak is the fact that it performs reasonably well under so-so seeing, try that with larger instrument and you will be disappointed. Well, for those that have missed out, the delivery has taken so long that some owners will be reaching the point where they cannot safely handle a scope this size and weight. I’ve acquired both my MK91 and APM/Wirth MN86 this way - though admittedly they’re not as rare as these AP scopes. But as a portable setup ... I’d say a 10” mak is too big. My MK91 OTA is about as big as I can safely lift at 13kg and resembles a water heater to lift. In comparison an Intes 715D or SW180mm mak or TEC 8” are a nice size. As for performance in average seeing - all scopes with high quality optics (strehl above 0.94) will appear far less affected by seeing than scopes with lower quality optics. I’ve seen this many times with the MK91 and Intes 715D side by side with 8-10” SCTs. Edited by luxo II, 26 November 2018 - 06:40 PM. Not sure about the new 10" Mak but the original AP 10" Mak is only 15 kg, just 2 kg heavier than your MK91, not much more weight. It is quite happy on a Mach1GTO or a G11, will ride a 400 GTO for visual use. I have seen photos of the Mak 10 on a Mach 1. It would seem that mount would hold this OTA just fine. While not grab and go, it would be a portable setup. All of the individual components fairly lightweight. and am awaiting a deposit invoice. I also have been on the list since 1999.
and would prefer some sort of fork mounted Alt Az GoTo. living nearby to visit and have a look. The optical design follows the original concept of aspheric primary with secondary spot on the inside of the corrector. The simplicity of this 2-element optical system assures no collimation issues - the scope will always retain collimation and cannot be knocked out of alignment because there is no secondary mirror to fuss or adjust. The small 23% central obstruction assures the highest possible planetary contrast at high powers. This obstruction also acts as a baffle to keep stray light from the sky from falling directly on the eyepiece. For high-power eyepieces, a 23% obstruction is enough to fully shield the field of view from this stray light. When the field of view exceeds about 1 inch diameter, light from the sky can leak past the front baffle and reduce the contrast at the edge of the field. Therefore, for low-power, wide-field viewing with 2” eyepieces we provide a larger secondary baffle that will increase the front baffle size to 32% to block this stray light in the outer portions of the field. This is needed primarily when sky light-pollution is high and you are using low-power wide-field eyepieces to observe faint deep-sky objects. Under dark skies, there will be no difference in contrast. Note: this secondary baffle threads onto the front of the corrector. We have redesigned the mechanical and optical parts of this telescope to make it lighter weight and to enhance the performance even in falling temperatures. Weight was reduced two ways: the tube is now carbon fiber and the optics are substantially thinner and lighter weight than the original. The thinner optical components retain much less heat, which allows faster cool down. We are still using fused silica quartz for the mirror and high quality crown glass for the corrector. ● ●New lightweight carbon fiber tube assembly with machined aluminum covers to close and protect each end of the tube. The rear covers can be removed to allow internal heat to escape out the back for fast cool down. ● ●Precision focuser system that has no image shift. The internal moving mirror focuser rides on a jeweled mechanism that provides very smooth accurate positioning of the mirror. ● ●Removable felt-lined dew shield slides onto the front of the corrector and provides stray light baffling as well as trapping warm air from the corrector to prevent dew from forming. ● ●High-contrast multi-coating technology on the corrector, the same as we have used for our StarFire refractors in recent years, will provide optimum light transmission. ● ●Our optional CCD Telecompressor (CCDT67) can be used for faster focal ratio imaging with popular CCD cameras. ● ●The 2 inch field is flat and coma-free for stunning views with any wide-field eyepiece. No flattener is needed for imaging at prime focus for high-resolution images of distant deep-sky objects such as galaxies and globular clusters. Color Correction Essentially perfect from 706 nm to 430 nm (r to g wavelengths). Tube assembly White, 11.6” diameter, carbon-fiber tube, flat-black interior, engraved retaining ring. Includes covers and dew shield. Dew shield 11.5” x 12.6” length. Focuser type Internal moving mirror focuser; zero shift; 2.7” visual back with 2” and 1.25” adapters. Mounting Rings 11.5” mounting rings included. Carrying-case type Wood case with grey vinyl covering and foam-lined interior. Edited by John Vogt, 04 December 2018 - 02:32 PM. Edited by dscarpa, 04 December 2018 - 02:51 PM. It was listed in Mark Wilsons post, $22,000. If you are lucky to be a resident of the "Land of Lincoln" such a myself , well one would of had to cough up an additional $1815 8.25% sales tax. Edited by dscarpa, 04 December 2018 - 05:11 PM. what would the optical performance be like compared to a CFF or TEC 200 APO? Edited by sink45ny, 04 December 2018 - 04:36 PM. Has anyone compared it with the much cheaper tak Mewlon 250 on moon, planets and double stars? It has the light grasp of a 9 1/4" refractor, better resolution, superb contrast, and will cool down much, much faster. It's 1/10 wave system. The color correction will be better than either refractor. It won't need a monster mount like those two refractors. I have one of the originals and the very first thing most experienced observers say after viewing through it for the first time is to comment about the contrast. The scatter is so low that I was able to see Deimos and Phobos in the same fov as Mars without an occulting bar, confirmed by other observers [Edit: used MkV binoviewers and Zeiss Abbe Orthos]. Thermal management is amazing, and the new version is even better per AP. Where those refractors will shine is wide field observing. Edited by Paul G, 04 December 2018 - 07:43 PM. Must the the Zambuto of Maks like on Newts. Reading through the detailed description that AP provides, they have made every attempt to address each and every optical and mechanical nuance of their Mak Cass design. All of that comes together to create a premium, limited build instrument that will become heirloom class, passed down through the generations. Even better, it's made in America! Making Astronomy Great Again. The 10" Mak was originally slated to supply customers' desire for larger-than-six-inch refractors after AP decided the 180 EDF/EDT was too much trouble to continue. Roland said Marj didn't want him to lose any more hair or sleep figuring large refractors. The plan was to purchase the pre-made optics, pop them into OTA's made by AP. and be able to crank out large scopes without taking Roland away from figuring the 6" and under scopes. Once he had the optics, designed and made by Valery D of Aires, his perfectionism took over and it turned into a quest to make the best optical and thermal performing 10" scope possible, one that could take advantage of the often excellent planetary seeing at dusk while the temperatures were rapidly falling. He even worked the optics to make the star test identical on each side of focus, not a characteristic of this design, just to make the star testers happy. Overall it took nearly a year of his time to make a couple dozen scopes. I was on AP's and Company 7's lists for larger-than-six-inch scopes, got the #8 Mak in that small run. Are you the famous John Gleason? I would add, that a dedicated focal reducer designed specifically for the Mak-Cass would be an interesting accessory. AP does offer a CCD focal reducer made specifically for the previous MC. Not sure if that would work well for visual but I see it on their list of suggested options. My guess is that a 35mm Panoptic would be just fine on deep sky. Anything around 100X is ideal. The visual contrast would be remarkable from a dark sky site. You'd have reduced contrast and the scope would be more affected by seeing. Is the primary mirror 1/8 wave?